After a ten year career defacing the streets and gallery walls of Melbourne, street artist Reka is packing up and moving overseas but before he leaves he will be having one last show to celebrate at The Backwoods Gallery. He will be holding an open studio for one night only June 20th, displaying a new body of work exclusively painted on found objects plus throwing in some paintings from the past decade for good measure. As well as the upcoming show, Backwood Gallery have released a REKA ’10 years Retrospective’ print, the classic post up character from yesteryear screen printed over a hand finished aerosol tag.The print is available now and is a super limited edition of 25 so move fast! 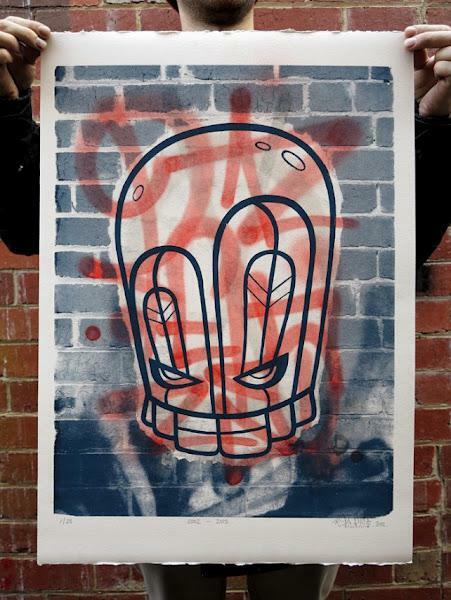 Each is a signed number, hand finished 2 color screen print on 300g Fabriano paper. Each of the edition has unique characteristics and can be your for $250 AUS from the Backwoods Gallery website.